KUALA LUMPUR: Glomac Bhd's earnings rose to RM22.24mil in the fourth quarter ended April 30, 2012 and expected earnings growth to be underpinned by its unbilled sales of RM731mil and development projects with a gross development value (GDV) of RM7bil. It announced on Tuesday the earnings were 49.1% higher than the RM15.02mil a year ago. Revenue rose 61.1% to RM247.66mil from RM153.73mil. Earnings per share were 3.90 sen compared with 2.54 sen. It also proposed a final dividend of 2.75 sen a share, compared with 2.50 sen a year ago. For the financial year ended April 30, 2012, its earnings rose 36.2% to RM85.78mil from RM62.98mil. Revenue rose 9.7% to RM655.61mil from RM597.47mil. Glomac group executive chairman, Tan Sri F.D. Mansor said anchoring the profits for the year were Glomac Damansara and Glomac Cyberjaya, as well as the final billings from the completed Glomac Tower. "With this, we are pleased to see that Glomac has consistently delivered steady growth in profits over the recent years. 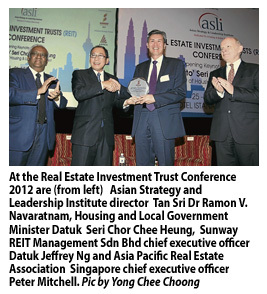 Our profits have doubled within two years from RM41mil in financial year 2010 to RM85.8mil in 2012," he said. He said new sales "have been encouragingly strong, reflecting the healthy demand for the projects we bring to market". Glomac's total sales of RM663mil in FY12 was higher than its internal target of RM500mil, driven by its prime mixed developments such as Glomac Damansara and Glomac Centro, as well as steady sales from its townships, Bandar Saujana Utama and Saujana Rawang.